How to lose weight by walking is one of the most common questions from women over 40. For beginners to exercise, a good walking for weight loss plan could be a good cardio workout. I love to walk in our neighborhood and to a nearby park. It’s a common walking path for many people out to enjoy the weather or trying to lose weight. 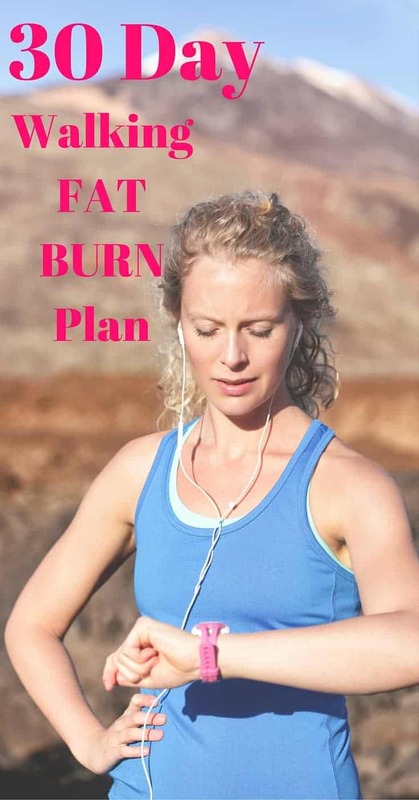 Get ready to burn that fat with a great cardio workout for women. Maybe you aren’t a lift weights high-intensity full throttle workout type of girl. That’s ok, you can lose weight by walking, starting today. I realize there are many different reasons you might want to choose to walk to lose weight. Perhaps you have a group of women you like to walk with, or you just enjoy being outside. Walking for weight loss can be a successful method for weight loss when you have a plan. Varying speeds of walking is a great way to burn more calories. Have a great, healthy nutrition plan in place…it takes effort in the kitchen also. Start by adding a protein shake such as this one to your diet daily – will help with protein AND vegetables! Be sure to grab these 5 things you should have on every walk! Comfortable walk – walking moderately fast, but can still carry on a conversation. Fast walk – as fast of a walk as you can handle, you could talk if needed, but it is not easy to carry on a conversation. Day 1: 1/4 mile comfortable walk, 1/4 mile fast walk. Repeat for 1.5 miles. Day 2: 1/4 mile comfortable walk, 1/4 mile fast walk. Repeat for 1.5 miles. Day 3: 1/4 mile comfortable walk, 1/4 mile fast walk. Repeat for 1.5 miles. Day 4: 1/4 mile comfortable walk, 1/4 mile fast walk. Repeat for 2 miles. Day 5: 1/4 mile comfortable walk, 1/4 mile fast walk. Repeat for 2 miles. Day 6: 1/4 mile comfortable walk, 1/4 mile fast walk. Repeat for 2 miles. Day 8: 1/4 mile comfortable walk, 1/4 mile fast walk. Repeat for 2 1/2 miles. Day 9: 1/4 mile comfortable walk, 1/4 mile fast walk. Repeat for 2 1/2 miles. Day 10: 1/4 mile comfortable walk, 1/4 mile fast walk. Repeat for 2 1/2 miles. Day 11: 1/4 mile comfortable walk, 3/4 mile fast walk. Repeat for 3 miles. Day 12: 1/4 mile comfortable walk, 3/4 mile fast walk. Repeat for 3 miles. Day 13: 1/4 mile comfortable walk, 3/4 mile fast walk. Repeat for 3 miles. Day 15: 1/4 mile comfortable walk, 3/4 mile fast walk. Repeat for 3 miles. Day 16: 1/4 mile comfortable walk, 1 mile fast walk. Repeat for 3 1/2 miles. Day 17: 1/4 mile comfortable walk, 1 mile fast walk. Repeat for 3 1/2 miles. Day 18: 1/4 mile comfortable walk, 1 mile fast walk. Repeat for 3 1/2 miles. Day 19: 1/4 mile comfortable walk, 1 1/4 mile fast walk. Repeat for 4 miles. Day 20: 1/4 mile comfortable walk, 1 1/4 mile fast walk. Repeat for 4 miles. Day 21: 1/4 mile comfortable walk, 1 1/4 mile fast walk. Repeat for 4 miles. Day 22: 1/4 mile comfortable walk, 1 1/2 mile fast walk. Repeat for 4 1/2 miles. Day 23: 1/4 mile comfortable walk, 1 1/2 mile fast walk. Repeat for 4 1/2 miles. Day 24: 1/4 mile comfortable walk, 1 1/2 mile fast walk. Repeat for 4 1/2 miles. Day 25: 1/4 mile comfortable walk, 1 1/2 mile fast walk. Repeat for 5 miles. Day 26: 1/4 mile comfortable walk, 1 1/2 mile fast walk. Repeat for 5 miles. Day 27: 1/4 mile comfortable walk, 1 1/2 mile fast walk. Repeat for 5 miles. Day 28: 1/4 mile comfortable walk, 1 1/2 mile fast walk. Repeat for 5 1/2 miles. Day 29: 1/4 mile comfortable walk, 1 1/2 mile fast walk. Repeat for 5 1/2 miles. Day 30: 1/4 mile comfortable walk, 1 1/2 mile fast walk. Repeat for 6 miles. Combine this lose weight by walking program with a good nutrition plan for maximum weight loss. Join the Facebook Weight Loss Group for motivation & support from me plus other women over 40! If you are like me, some great music keeps you motivated and your mind occupied during your workout. Good luck with your lose weight by walking program! Post your workout pictures on Instagram and tag me @fitfoundme! Great tips to loose weight by walking. I really liked it. Thanks for sharing. Please send calendar. Thanks ! There are some great tips for losing weight here. I like how you said that the first step is to have a good nutrition plan. Exercising, for me, is the easy part, so I’ll have to do a better job of watching what I eat. I would love to have the calendar,please and thank you?